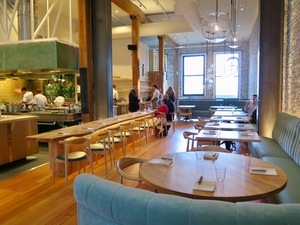 The airy and serene main dining room at Birdsong. All photos: tablehopper.com. 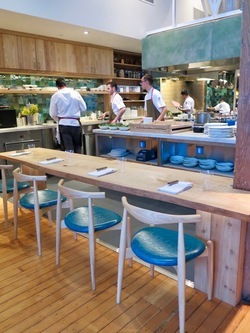 Half of the chef’s counter overlooking the open kitchen. The downstairs bar and meat locker/aging room. 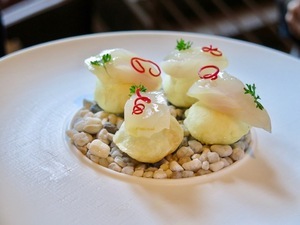 Fish and chips: a scallop snack with pomme soufflé. The Birdsong spin on New England clam chowder (with the evil Parker House roll brushed with pork fat lurking in the background). Last week, I took a break from the madness of my new business launch and event hosting and soaked in the tranquil and chic atmosphere at the newly opened ~BIRDSONG~ in SoMa. The former AQ has been given quite the makeover from the design firm SAINT. There’s a handcrafted aesthetic with all the custom woodwork, but it doesn’t feel like something we’ve already seen before. Jeremiah Collection and Max Johnson crafted ash tabletops, Douglas fir flooring, custom cabinets, and more, balanced with pops of sea green. Even the open kitchen is full of wood instead of stainless steel, so diners who opt for the chef’s counter have a view of an enviable kitchen (designed by Alec Bauer from Kitchen Restaurant + Bar Specialists), with a Hestan custom oven suite and hearth. 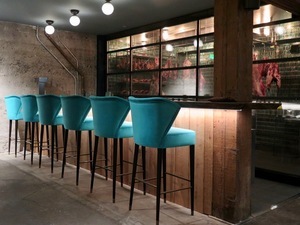 Below, there are two private dining rooms (with room for 10 and 30), with a fun bar counter with peacock blue seats that look into a custom, walk-in glass meat locker accented by tiles that shimmer like abalone shell. There’s also a comfortable lounge area—the idea is guests will eventually be able to enter the downstairs lounge through a separate entrance on Minna and enjoy wine and bites. The chef-owner is Chris Bleidorn, whose background includes Saison, Atelier Crenn (where he served as chef de cuisine), Benu, and Alinea. For Birdsong, he is creating a menu that pays homage to the Northwest (although he’s from the East Coast), nature, and employs heritage cooking techniques (like live fire, smoking, dry-aging, and fermenting). His ingredient sourcing is impeccable, as you can imagine, spanning NorCal to Alaska, featuring beautiful seasonal mushrooms, cold-water shellfish, and wild game. His chef de cuisine is Brian Limoges (previously executive sous at Quince and sous chef at Atelier Crenn). Right now, you can experience the tasting menu for $135, which will go up to $168 on May 29th, when the preview is complete (an à la carte menu is launching soon as well). 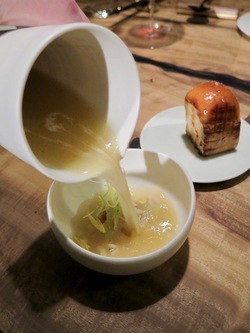 It includes 13-14 dishes, including playful yet elegant snacks like a fun spin on fish and chips (halibut draped over little puffs of pomme soufflé stuffed with tartar sauce), and their bacon and eggs (little rolls of dried bacon filled with egg yolk, caviar, and crème fraîche and dipped into chives). Inventive and delicious, another round, please. Everything is served on custom ceramic plateware, designed by Bleidorn with Korean ceramic company KwangJuYo (taking a page from Benu’s playbook). The Benu connection doesn’t stop there: Bleidorn’s life and business partner is Aarti Shetty, director of operations for Benu, Monsieur Benjamin, and In Situ. The sommelier is Freddy Foot (formerly Gary Danko), featuring lesser-known selections from the Pacific Northwest, along with classic European wines, plus quality craft beers from Oregon, Washington, and British Columbia. Open Tue-Thu 5pm-8:30pm and Fri-Sat 5pm-9:30pm. 1085 Mission St. at 7th St.